Charro Beans Soup & Carne Asada ( frijoles Charros) will show up together most of the time at an evening outdoor party in the Northeast region of the country where I am from. I know some call them “Cowboy beans” on this side of the border, but believe me, the Mexican recipe is a little different. In Mexico, a Carne Asada party just takes a couple of phone calls from relatives, friends or “compadres” to organize a plan to see who will bring in the steaks, drinks, salsas, guacamole, tortillas, onion, and the charro beans soup pot. And if you add a cup or two of beer to the pot of charro beans soup they become “frijoles borrachos” (drunken beans). 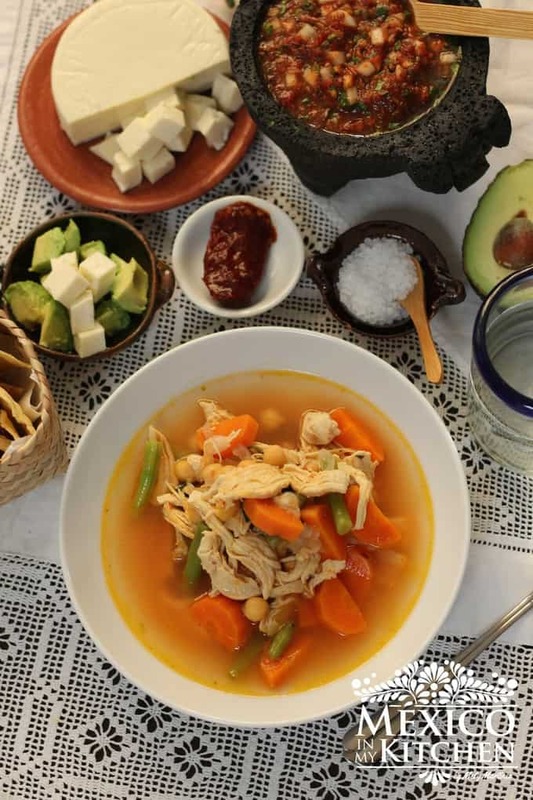 Steakhouse restaurants in Mexico will bring this soup to your table before your meat dish without you even asking for it. The soup by itself is a hearty dish to have on a cold winter day. I love to make extra to store in the freezer. They taste even better when you reheat it. Plus, it’s really handy for those cold days when you don’t feel like cooking, just defrost it, and serve with warm tortillas. Charro beans soup is made with pintos beans, bacon, chorizo, ham and a rich tomato-based sauce. Here is a basic recipe the way I prepare Frijoles Charros in my kitchen, you can add other meats to the soup, that is what most cooks do, right? Personalize and adjust to your taste. Sometimes I add pork rinds or sliced hot dogs sausages, too. Some cooks also add pork rinds in small pieces to their Charro Bean soup. To cook the beans place 2 cups of dry beans, 1/4 of a medium white onion, 2 peeled garlic cloves and 8 cups of water in a large pot. To cook for about 2 hours or a little bit longer until they are tender. Soaking the beans overnight will speed up this process. I usually use my pressure cooker and they are done in 30 minutes. Place the beans and its broth in a large stockpot and set aside. Fry the bacon and chorizo in a skillet over medium heat for about 10 minutes. If you prefer to cook the bacon first until it gets crispy and remove the fat, then add the chorizo to cook with the bacon. I just like to cook them together. At this time add the ham or other meats like 1/2 a cup of diced hotdog sausages and 1 cup of pork cracklings, if using them. After 5 minutes add the onion, garlic, and pepper and fry for 2 more minutes. Stir in the Chopped tomato and cook, stirring occasionally for an additional 8 minutes. Once the tomato has released its juices stir in this mixture to the pot with the beans. And simmer for about 15 minutes, to blend the flavors. Add water if necessary. The consistency shouldn’t be thick. Add salt — to adjust taste — and chopped cilantro right before serving. Serve the Charro Bean soup in large bowls and warm tortillas. 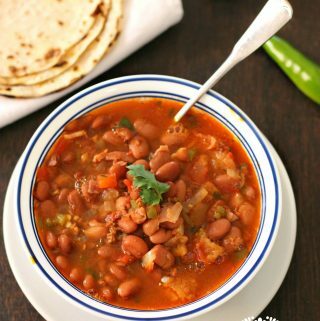 Charro Beans Soup, this traditional Mexican recipe uses pinto beans, chorizo, bacon, tomatoes, onions, and other tasty ingredients. Fry the bacon and chorizo in a skillet over medium heat for about 10 minutes. If you prefer to cook the bacon first until it gets crispy and remove the fat, then add the chorizo to cook with the bacon. I just like to cook them together. At this time add ham and other meats like one 1/2 of diced hotdog sausages and 1 cup of pork cracklings, if using them. Once the tomato has released its juices stir in this mixture to the pot with the beans. Add ham and pork crackling is using at this time. And simmer for about 15 minutes, to blend the flavors. Add water if necessary. The consistency shouldn’t be thick. Serve in large bowls and warm tortillas. Some cooks also add pork rinds in small pieces. Share on your social networks; it only takes 5 seconds. Thanks! En español Frijoles Charros Receta. Filed Under: Celebrations, Soups Tagged With: Authentic Mexican Charro Bean Soup, bacon, beans, Charro beans, Cowboy beans, Frijoles a la Charra, ham, Pinto Beans, pork cracklings. my mom, her mother and her grandma made delicious frijoles a la charra. They did not include chorizo, but cueritos (the raw pork rinds) were always part of their recipe, and now mine as well. They also added 1/2 cup of pork lard and the beans and broth tasted incredibly-delicious. The last 15 minutes of cooking, they also added 4 serrano peppers-whole-because the children did not like the hot beans. That way, the adults who liked the spicy beans, simply got one of the serrano peppers and mashed it with a fork, making their beans hot. Seeing your recipe brought back so many memories of my beloved family cooking the huge jarro of beans on a daily basis. 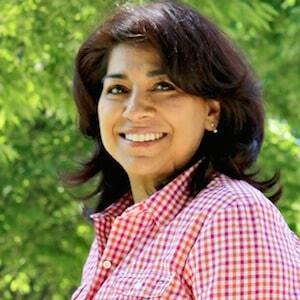 In my family, we have always used the fresh garlic cloves, the cumin seed, the molcajete, variety of peppers, coriander,… Congratulations on your magnificent blog, Mely. 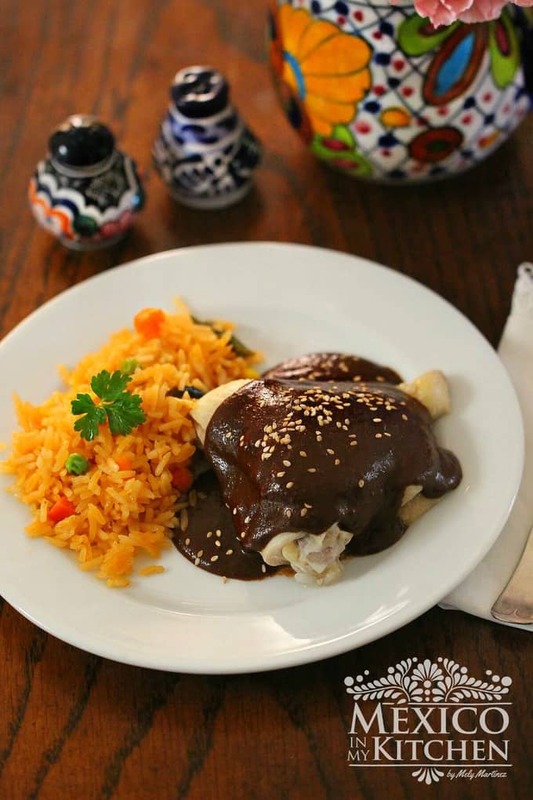 You are sincerely a trailblazer with all those Mexican dishes you highlight. Thank you for not allowing those culinary gems to be lost and forgotten. Thanks a lot for sharing all those valuable tips. I’m sure many people will benefit from them and apply them to their dishes. Again, thank you for your kind words.